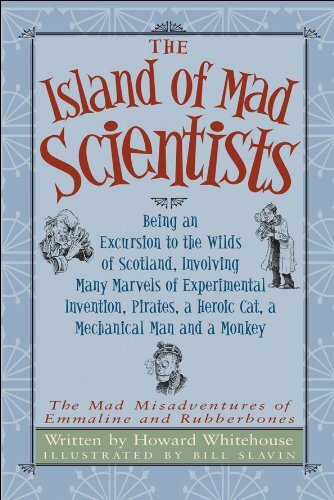 Aviatrix Emmaline Cayley, test pilot Rubberbones and the rest of their wacky household face a new adventure in the wilds of Scotland in this third installment in the Mad Misadventures series. On the run, the friends decide to rendezvous on the Scottish island of Urgghh, a place devoted to scientific experimentation where they believe they will find refuge. Unfortunately, not only are the scientists mad - the island is anything but safe. A villain known as the Collector, who devotes his time to kidnapping inventors, lives next-door. Journey with our friends to the Island of Mad Scientists, where Emmaline and Rubberbones catapult into the middle of the Collector's devious schemes. Drunken pirates, a kilt-wearing mechanical man and Queen Victoria come to their aid! Squabbling scientists, a bungling ex-jewel thief and other nefarious fellows hinder them!